Carl “The Cobra” Froch will look to become a 3-time world champion when he takes on IBF champ Lucian Bute in his hometown of Nottingham tomorrow night. Both fighters weighed in under the 168 limit, with Froch weighing 167.3lbs and Bute coming in at 167.75lbs (see a video of the weigh in below). This is a fight that is too close to call in my honest opinion. Bute has been very well protected back in his adopted home of Canada and hasn’t fought the names or quality opposition that Froch has. Bute, unbeaten in 30 fights with 24 wins coming via KO, has looked very skilful in dispatching his opponents who, in truth, are a level or two below him and a level or two below Froch. He’s a silky, quick southpaw whose big body shots could cause serious problems for Froch, who has looked vulnerable against the more skilful boxers such as Andre Dirrell and Andre Ward. However, Bute hasn’t been in there with anyone like Carl Froch before. He continues to press for 12 rounds and won’t give you a moment’s peace. He possesses a granite chin, a fantastic work ethic and packs a serious punch. How will Bute cope with that sort of pressure? Let’s not forget he was rocked big time (and in my opinion out for the count) against Librado Andrade. While Bute has been very well protected through his career up to date, the same cannot be said of Carl Froch. His run of opponents is unheard of in modern boxing and he is the true definition of a warrior. Froch will bring with him a wealth of experience of fighting at the elite level (something Bute does not have); he’ll have the backing of the home crowd, a relentless determination and has genuine knock-out power. The question is will he be able to impose himself on Bute? How much has that defeat against Andre Ward taken out of him? We all know Froch is a warrior and he tends to let that get the best of him. It’s something he cannot allow to happen in this fight, he has to make sure his defence is on point. He can’t allow Bute to target the body too much. We all know Froch has a granite chin but a well placed body shot can send anyone down to the canvas. When he gets on the inside and he’s stopped throwing, tie Bute up. Don’t give him the chance to target the body. Another thing that is vitally important is for Froch to get a good start. He can’t allow Bute to get into any sort of rhythm and build up a substantial lead. He has to get that jab going from the very start, and none of that flicking the lazy jab like has done in previous fights. Get back to the jab he used so superbly against Abraham. This is a defining fight for both guys. A win for Carl Froch and he’s back amongst the big boys at 168 and it would put his record beyond reproach. While a loss isn’t career ending, it certainly puts a big dent on his career. Is he just a guy who can fight the elite or is he one of them? A win for Bute and he finally has a legitimate name on his record and he cements himself among the elite and a potential fight with Super Six winner Andre Ward looms. A loss for Bute is slightly more damaging. The bloggers and forum posters will have enough ammo to declare that Bute is not among the elite performers and that they were right about him from the start. With that said I really can’t call the fight. It’s a real tough one. 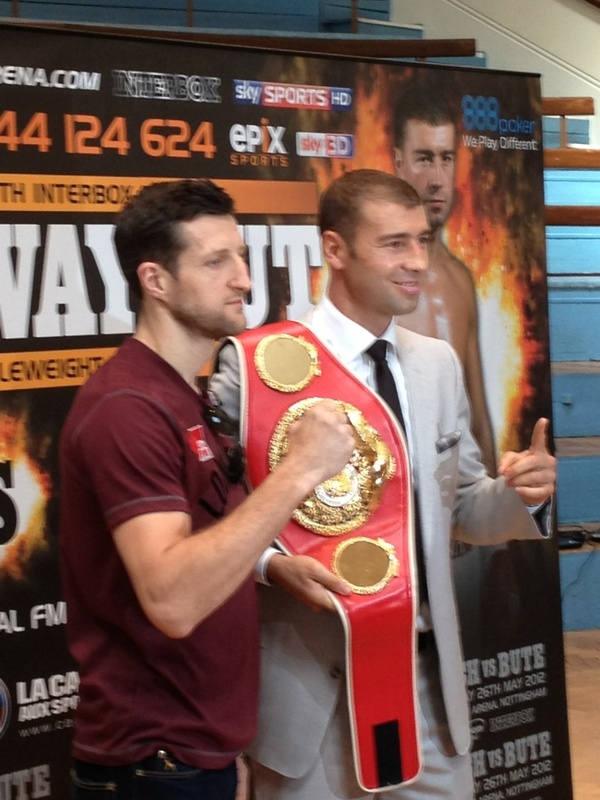 How will Bute hold up against the pressure and power of Froch? How big a role will the crowd play? How will Froch deal with the champ’s body shots and southpaw stance? If I had to choose, I’ll edge towrds the home town boy to win via points but I wouldn’t bank on it. I’ve changed my mind/prediction hundreds of times already and I’ll probably change it a hundred times again by the time the fight comes round. After two years of blood, sweat and tears the much maligned Super Six final will take place, with two of the original cast ready to battle it out for the trophy. Nottingham’s warrior Carl “The Cobra” Froch faces off against Oakland native Andre “S.O.G.” Ward in Atlantic City to decide who is the number one super middleweight in the world. The winner of this fight is sure to be launched into boxing “super stardom” and possibly face Lucian Bute for the IBF title. Both fighters have faced tough opposition during this tournament and fully deserve their place in the final. Ward has beaten the Mikkel Kessler, Allan Green and Arthur Abraham but has had the luxury of never having to fight outside of America. He even had the comfort of having his first two fights being in his own backyard of Oakland, California. His promoter, Dan Goossen, deserves a major pat on the back for getting such a brilliant deal for his fighter. But that should not detract from the fact Ward has never been in trouble against any of his Super Six foes. Kessler, the tournament favourite, was outclassed for 11 rounds before being stopped following a clash of heads. Now Ward has received some criticism for this, with the Kessler camp believing they were deliberate, but Ward earned a technical decision victory to claim the WBA super middleweight title. Up next for Ward came fellow American Allan Green. Ward fought superbly on the inside, backing up Green on the ropes for most of the fight, and dominated to cruise to a unanimous decision victory. Those two victories earned Ward a semi-final bout with Abraham. Ward started out a little slowly but took control from around the 3rd/4th round and dominated the gutsy Abraham. Abraham never really troubled Ward until the last round, where he did manage to hurt him a few times, but it wasn’t enough and Ward, once again, cruised to a lopsided unanimous decision. It’s fair to say that Carl Froch has had a much tougher road to the final. Froch’s first fight came against the slick Andre Dirrell in his home town of Nottingham. Froch struggled to get close to Dirrell, who fought superbly, and was very fortunate to earn the split decision victory. It’s fair to say it was definitely a home-town decision. But Froch was on the receiving end of a controversial decision in his next fight against Mikkel Kessler. Froch started out slowly and Kessler took advantage in the early rounds. However Froch did rally in the later rounds to make it a close fight, with both fighters having their moments. But the decision went to the home fighter as Kessler claimed the WBC title and inflicted Froch’s first professional defeat. However, following Kessler’s withdrawal from the competition, Froch was awarded the opportunity to earn back his WBC title against Abraham. Both fighters were in the last chance saloon in the tournament but it was Froch who rose to the occasion as he produced his best performance to date, dominating Abraham from start to finish, defying the critics who believed Froch was nothing more than a brawler. Froch stuck to the game plan given to him by trainer Rob McCracken and used his jab and reach to keep the powerful Abraham at bay, as he re-claimed his WBC title via a unanimous decision. The win over Abraham sealed Froch’s place in the semi-final against veteran Glen Johnson. The opening few rounds gave little away as both fighters felt each other out but Johnson upped the pressure in the following rounds. Froch managed to keep him at bay by landing good counter punches and combinations. But Froch slipped back into his bad habits as he kept his left hand low, allowing Johnson to connect with straight rights through the middle rounds. Froch displayed his fantastic chin and fought back with good combinations once again to force Johnson back. As Johnson began to gass, Froch upped the pace and won the championship rounds convincingly to earn his place in the final against Andre Ward. Carl Froch has all the heart and determination in the world and I’m really hoping he can pull it off. He’s been Britain’s best fighter for some time and it’s a travesty he hasn’t had the recognition he’s deserved. However he does face a massive test against the heavily fancied Andre Ward. It’s fair to say this is the toughest fight either fighter has had so far and it’s a tossup as to who will win. Andre Ward is betting favourite but Froch should not be easily dismissed. Froch has the height and reach advantage and will have to use that to his advantage, using his jab to keep Ward off balance and to back him up. He’ll have to be more disciplined than he was against Johnson and keep his left hand high up, because even though Ward isn’t a massive puncher he can’t afford to give Ward that kind of target on a regular basis. Froch will have to try and find the right balance between his style for the Abraham and Johnson fight. Use the rangy jab to keep Ward backed up and use combination punching to hurt him whenever possible. Froch has the ability to really hurt Ward but Ward will be the smartest fighter he has faced and won’t just give Froch his chin. But if Froch can catch Ward, then we’ll really see what Ward is made of. I’m really unsure as to who is going to win this fight. I’m hoping to see Froch pull through and claim the win but the more I’ve seen of Ward, the more I like. His style isn’t great to watch at times but he’s produced some superb boxing in spurts throughout this competition and displayed a range of different qualities which has seen him progress to the final. He’s a very smart boxer and he knows how to fight on the inside. He does like to throw the jab to miss on purpose, so it allows him to get close and clinch his opponent allowing him to work on the inside. The upper-cut would work perfectly for Froch here. My heart is saying Carl Froch on this one but my head is going with Andre Ward winning the fight in a similar fashion to Mayweather – Hatton (just without the help of the ring post). Either way it promises to be a fantastic fight.